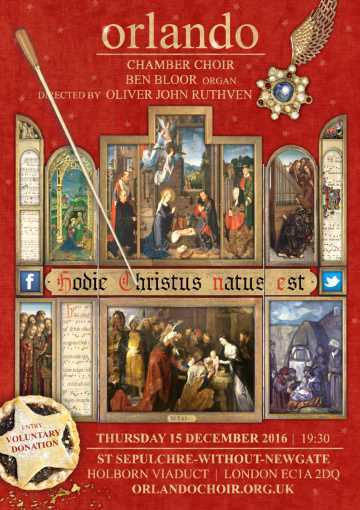 Orlando Chamber Choir welcomes guest director Oliver John Ruthven for its traditional Christmas concert, this year with a focus on Hodie Christus natus est, the festive Magnificat antiphon for the vespers of Christmas day. Setting mood and melody with the atmospheric Gregorian Hodie chant, the programme includes a jubilant late-Renaissance version by Sweelinck, an early baroque setting by Schütz which skips and dances for joy in duple and triple time, and a playful yet solemn mid-20th century interpretation by Poulenc - part of his Quatre motets pour le temps de Noël all of which you get to hear! Since 2013, Orlandian Christmas concerts have included one of the seven Magnificat antiphons for the end of Advent. This year we perform James MacMillan's O radiant dawn which, written in 2007, explores contemporary harmonic ideas but also clearly refers to the sound world of the English Renaissance. The programme is interspersed with short Christmas readings and audience carols, accompanied by organist Ben Bloor - who also contributes a solo. In true Orlandian style the interval is enlivened with wine, mince pies and an exciting Christmas raffle.